The view from the condo balcony is worth the trip alone! The clear blue water of Lake Dillon surrounded by picturesque mountain vistas is breathtaking! Beyond the view, each season offers unique opportunities. Located in the heart of Summit County ski country, snowy downhill and cross-country ski adventures turn into hiking, biking, and horseback riding in the warmer months. Explore the trendy boutiques, outlet shopping center, and restaurants for every taste. There is definitely something for everyone! This condominium consists of 1,132 square feet of space. The entrance is heated and provides a secure area for ski equipment. The first bedroom has a queen-size bed adjacent to a ¾ bathroom. The second bedroom has two full-size beds adjacent to a full 4-piece bathroom. A queen-size hide-a-bed is located in the living room for extra guests. The combined living and dining area has a vaulted ceiling that lends to the spacious atmosphere of the unit. A gas fireplace set in floor to ceiling stone adds ambiance and warmth. The kitchen is fully equipped with new microwave and glass cook top range. A large island provides extra seating and space for food preparation. The condominium includes a washer and dryer, parking space, single garage stall, and gas grill on balcony. The complex has a separate clubhouse with heated pool, jacuzzi, and sauna. Summit Stage offers FREE transportation to all ski and shopping areas, and stops at the east entrance of the condominium complex. The condominium is located on Highway #6, two (2) miles east of the Dillon/Silverthorne exit #205. Keystone is approximately ten minutes away while Copper Mountain, Breckenridge, and Arapahoe Basin are about 20 minutes away. Single stall garage plus one spot in parking lot. Additional spots upon request. We have stayed in this complex for the past 5 years, first year for this unit. Great location for our ski interests. Very comfortable unit, especially the beds, quiet unit on 3rd floor. Had an issue in the unit, contacted the owner and it was dealt with the next morning. Would stay there again, hopefully next year. Thanks Stacie. Condo is very spacious and conveniently located near Dillon and the surrounding ski areas. Outdoor gas grill was a plus, not to mention the beautiful views from the balcony. You can't beat it for the price; highly recommended! We loved our stay at this condo. Very good location, awesome view, huge balcony. Usually by the picture difficult to evaluate the size and quality of the apartment. In this case we were pleasantly surprised that it’s so large and convenient. Condo is everything you need. Great location central to all of the big resorts. Covered parking is huge during the winter. I would stay here again. We stayed here March 2018 and it is perfect location if plan to ski multiple locations. Close to town allowed for easy access to groceries, coffee and places to eat on our way to and from the slopes. The view of lake, though frozen, was great and the kite boarders kept us entertained. The condo was clean cozy and very comfortable. Though it may not be as modern as some condos it's location and comfort were perfect for our group! 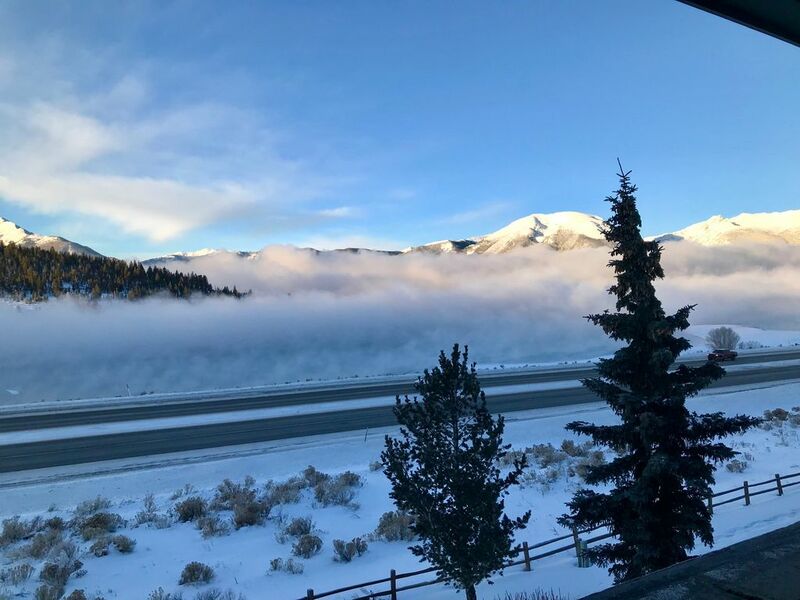 Super views, Central Location with easy access to multiple ski areas (skied A-Basin and Copper - although Keystone & Breck also closely nearby). Really liked the oversized double beds in the 2nd bedroom. Can't beat having garage in winter. Would have liked the hot-tub to be outdoors - although the rest of unit made up for very positive experience. Full payment due 30 days before check-in. Reservation made more than 60 days in advance may make 2 equal payments if authorized by property manager. Lat minute reservations with credit card payment. Rental agreement must be signed before check-in.